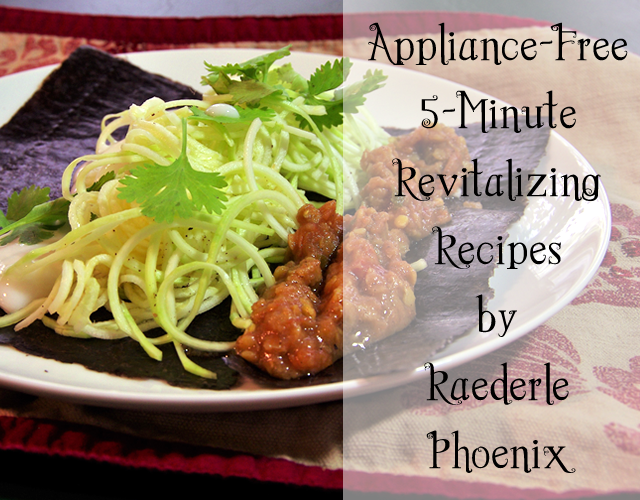 Raederle: Ridiculously Delicious Recipes In 5 Minutes! Ridiculously Delicious Recipes In 5 Minutes! 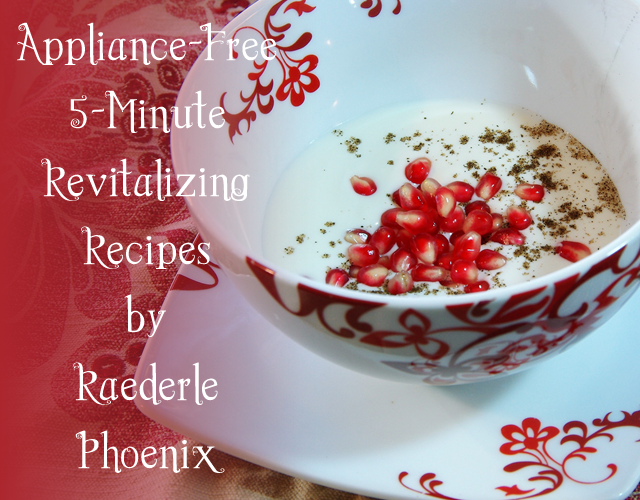 Coming this winter of 2017, my new book, Appliance-Free 5-Minute Revitalizing Recipes! These healthy recipes are crazy easy, and yet they're completely unique creations. You know how difficult situations lead to new innovations? That's what's created these healthy, quick, satisfying and insanely delicious recipes. Let me explain. When I was sixteen I developed stomach-ulcers due to severely repressed fear and other emotions. I was putting on weight and becoming increasingly incapable of functioning. The level of pain I experienced in my stomach each day was debilitating. After a year of pain I went on an elimination diet. I felt incredibly better. I discovered raw foods. I lost thirty pounds in thirty days without adding exercise to my lifestyle. I went vegan for three years, and then discovered that I benefited from included raw goat's milk, raw goat's kefir on occasion. Along the way I began traveling increasingly often and for longer and longer durations. It began with a three-week, 9,000 mile road trip when I was seventeen. By twenty-four, this expanded into trips as extravagant as five months on Kaua'i island – the most beautiful Hawai'ian island. During my travels I needed food that was easy to prepare, and yet healing for my body. I needed foods that could ward off chronic constipation, and yet be affordable. Afterall, I've been living on $8,000 a year (or much less). If you're curious about how I traveled so much, ate all organic foods, and lived a very modern, exciting life on so little money, check out my book, Living Big & Traveling Far on $8,000 a Year (or Less!). Between extreme health struggles, unusual dietary choices, a limited budget, and the strong need for travel-friendly appliance-free recipes, I learned dozens of unique combinations of food that were satisfying, yet very quick to prepare. 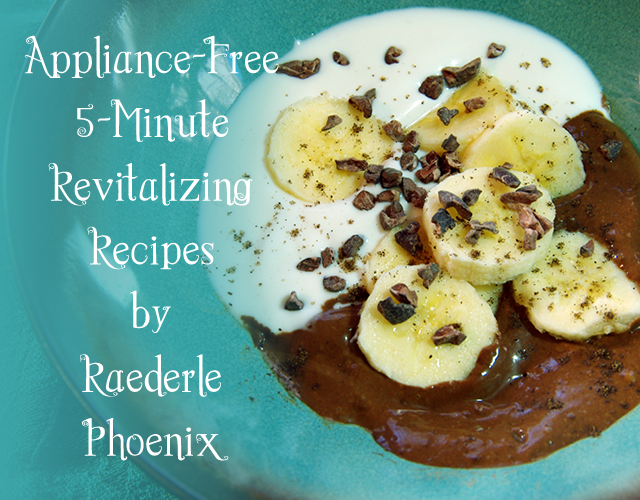 Now, finally, I'm compiling these recipes into a new book – Appliance-Free 5-Minute Revitalizing Recipes. This idea was crafted on the road when I didn't have access to appliances, but I began using the recipes I invented while traveling even while I was at home. Do you get tired of washing your blender, food processor, dehydrator, spiralizer and every other gadget? Imagine a gadget-free process at every meal without compromising on health or flavor. That's what this book offers you. You may know me as a raw food chef, but this book isn't just for raw foodies. It is a book that incorporates raw food concepts and creativity into a lifestyle that is convenient and easy. The only appliance you need for for this recipe book is a way to make hot water (a tea kettle or a pot and a stove). That's it! Like a raw recipe book, you don't need a toaster, microwave, oven or pressure cooker. But unlike a raw recipe book, you also don't need a high-speed blender, food processor or juicer! Because these recipes are so easy, the learning curve is a breeze. Maybe it takes you ten minutes to make a recipe for the first time, but the second time you know what you're doing and it only takes you five. You don't have to invest hours into this new lifestyle. And you'll feel so satisfied with these meals that you'll be craving-free. If you're still hungry, you can whip up more of the same or a different recipe from the book right away even on a fifteen-minute lunch break. How awesome is that? This is also the first book I'm offering in print! All of my previous books are only available as e-books, ever since my first recipe book (Nut-Free Raw Recipes) from 2010. I've come a long, long way in these seven years, and now you get to benefit from all I've learned. 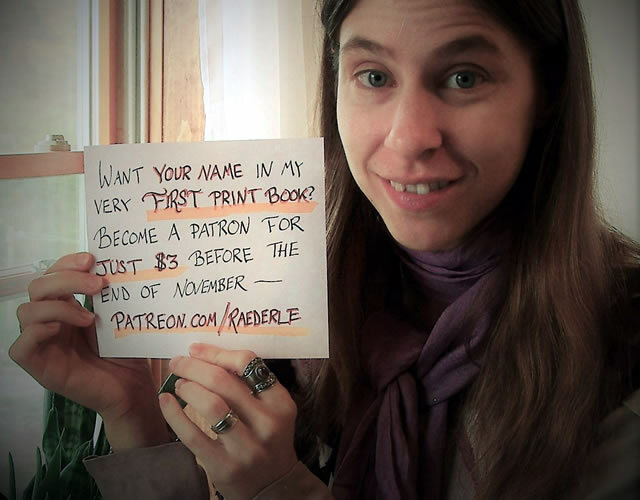 Learn how you can get your name printed in the book, get your print copy and more by clicking here.